(L - R) Ms Alicia Chenoweth, Ms May Lin Yap and Professor Mark Hogarth. Monoclonal antibodies have made international headlines thanks to their role in “immunotherapy” treatments for cancer. Burnet’s Professor Mark Hogarth reveals how they have revolutionalised the treatment of many once incurable diseases in the latest edition of IMPACT magazine. mAb have revolutionised the treatment of many once incurable diseases, including melanoma and chronic lymphocytic leukemia. Burnet’s Immune Therapies group focused on creating the next generation of monoclonal antibodies to treat intractable illnesses. The team are particularly focused on “Fc receptors” which are powerful molecular switches. Image: A 3D-image pf a therapeutic mAb magnified 10 million times. The antibodies four chains - two heavy (blue) and two smaller light (red) chains. When Professor Mark Hogarth and his mentor Professor Ian McKenzie became some of the first Australians to make monoclonal antibodies (mAb) in a lab in the 1970s, they hoped the technology would create new medicines. Forty years on, these immune system products have revolutionised the treatment of many once incurable diseases and they remain one of the hottest topics in medical research and clinical medicine today. In recent years, monoclonal antibodies have made international headlines thanks to their role in “immunotherapy” treatments for cancer. In Australia, for example, AFL footballer Jarryd Roughead became a poster boy for Nivolumab, a monoclonal antibody that is now destroying melanoma for many. Nivolumab is one of about 80 mAb therapies available to treat diseases including cancers such as chronic lymphocytic leukemia, Hodgkin’s lymphoma, multiple myeloma, and also inflammatory diseases such as rheumatoid arthritis, making them a USD$150 billion industry. Behind these immunotherapy medicines is a lot of hard work in research laboratories, typically over decades, to find biological pathways that can be exploited to combat disease. Professor Hogarth and his team at Burnet are at the forefront of this science and now they’re focused on creating the next generation of monoclonal antibodies to treat intractable illnesses. Disease targets include some types of breast, colon and ovarian cancers, as well as autoimmune diseases such as lupus, and infectious diseases such as HIV, malaria and Ebola. “I think we know about 10 per cent of what the immune system does at the moment, so there’s a fair way to go with a lot of opportunity,” Professor Hogarth, Head of Immune Therapies Group said. The expertise of the group lies in understanding the way mAb (genetic clones of antibodies that naturally fight disease as part of our immune system) interact with the white blood cells to harness the immune system. Professor Hogarth and his team are particularly focused on “Fc receptors” which are powerful molecular switches. They interact with mAb to either switch on the immune system to attack cancer cells or alternatively switch off the immune system if it’s being over active and causing illness, as is the case with inflammation and autoimmune diseases like allergy or lupus. Using their pioneering knowledge of these receptors, Professor Hogarth and his team, which includes PhD students Alicia Chenoweth and May Lin Yap, are engineering and testing novel forms of mAb to make them more effective disease killers. The group’s work of three decades has revealed how these “on/off” switches work, so it is now possible to modify the antibodies as “super killers” or “super inhibitors”. While trying to find new medicines is the priority, Professor Hogarth said this work also has the potential to improve lacklustre antibodies that could now be engineered to have more of an effect. There are also antibodies that have been dumped from clinical trials because they’ve been too potent. “There is one antibody that nearly killed six people in a phase one clinical trial. It failed because it was too potent, so we’re working on that antibody to see if we can remove that adverse reaction,” he said. On a daily basis, the team evaluates the new antibodies for their potency and how they can be manipulated to activate the Fc receptor switches and therefore direct the immune system to treat various diseases. For targets and disease models, they collaborate with other national and international researchers and bio-tech companies such as Genmab in Europe, which is using some of the Hogarth group’s discoveries as part of their cancer research and development programs. Importantly, close collaboration with such companies is essential, as new medicines must be developed through clinical trials in people, which typically cost more than USD$100 million. Another pioneering advance has been the work of PhD student May Lin Yap who has found new ways to see the mAb working in the body. Cancers in the body are complex and variable in their characteristics. Ms Yap uses a special protein, made by Dr Bruce Wines and Ms Sandra Esparon in the Immune Therapies group to visualise the mAb only if they are able to kill the cancer cells. It is hoped the imaging technique that has been demonstrated in animals will be able to show doctors which patients are responding to mAb therapies. This would make treatment more efficient because people who do not respond can move on to other therapies sooner and be spared any side effects from an ineffective intervention. If Burnet can access funding for postdoctoral fellows to pursue these studies, the team hopes to refine this science in coming years, with a goal to apply it to human studies. 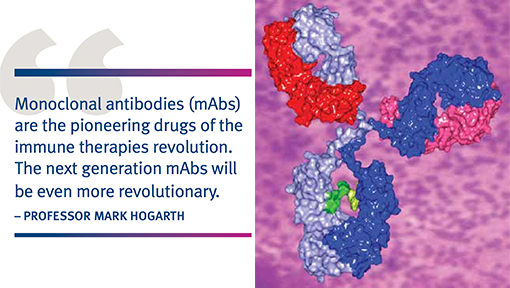 While there is great enthusiasm for immunotherapy at the moment, Professor Hogarth said the Australian industry has been slow to respond to the mAb revolution. It’s a trend he hopes will end soon.